Finnish driver Tapio Laukannen is the champion of the Eldoret Rally held on Saturday.Laukannen ,now nicknamed the flying Finn with his Subaru Impreza,survived two punctures to bag his fourth successive victory in the 2016 KCB Rally series. Driving a Ford Fiesta, Tapio's teammate Manvir Baryan of Multiple racing navigated by Drew Sturrock finished 52 seconds behind Tapio while Rajbir Rai finished in third spot coming ahead of Carl flash Tundo who was 4th . Veteran driver Ian Duncan was unlucky as he bowed out in the opening phase of the Eldoret Rally when his Mitsubishi Lancer Evo10 blew up its Turbo. 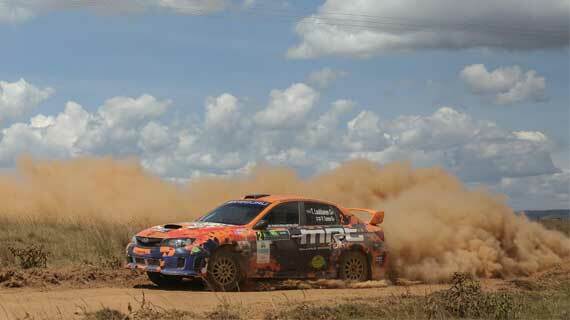 Jasspreet Chatthe was time barred as his Mitsubishi Evo10 developed a steering trouble at the fourth stage.